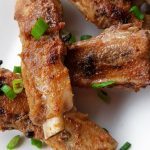 These easy honey garlic ribs (Instant Pot ribs) are sweet and salty and so darn delicious. Perfect as an appetizer on game day, a snack or main dish! 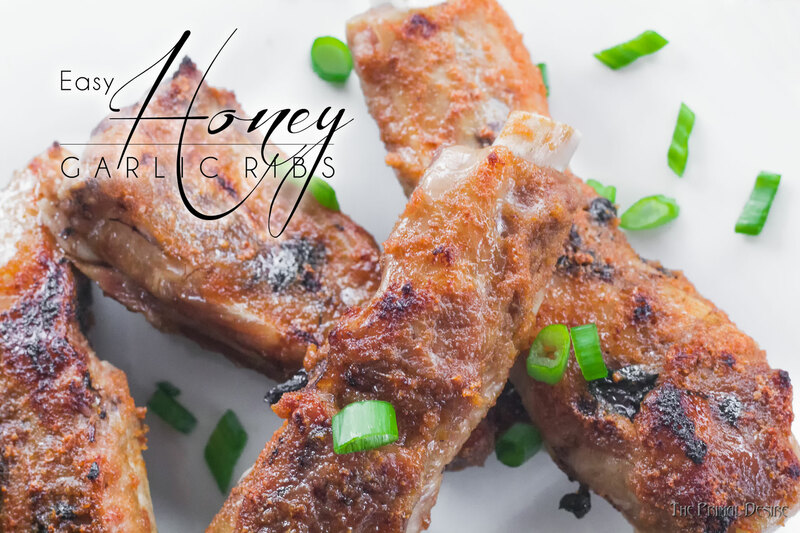 I missed out on these Easy Honey Garlic Ribs the first time Holley made them. She send me the first two photos below, and the friend I was visiting in Vancouver asked if we should make the 4-hour drive to get some. That was followed by two minutes of silent contemplation by both of us. I think the snow was legitimately what ultimately prevented the drive…. Kequyen, these are right up your alley! Once you get back from the Olympics you'll need to try them out. (Don't know what I'm talking about? Check out my interview with Kequyen). I've decided my 2018 will start on February 1st – January is a free-trial month. 100%. My cough continued over 3 weeks. Even went to the ER for x-rays to rule out pneumonia and a cracked rib. (I feel like I told the story about my cracked rib in the Killer Paleo Horseradish post…). How are your New Year's resolutions going? About ready to start your second attempt? See, this is exactly why Holley and I wrote the “I'm Hungry! What Should I Snack On?” ebook! We're both starting the month out at a conference for wellness influencers, ShiftCon, in Irvine, CA. Getting out of the snow and catching some rays! YESSSSSS! This is the perfect start because I am confident that we will connect with some great people that may alter the direction of 2018. We'll keep you posted. Watch our social media accounts to see how this trip goes. Ah-ight. Back to the Easy Honey Garlic Ribs. 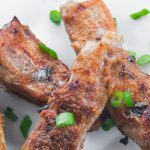 Eat these Easy Honey Garlic Ribs while watching the Superbowl on gameday, while watching Kequyen skiing at the Olympics, or on a Thursday afternoon. If you're looking for more Game-Day bites, we got 'em. 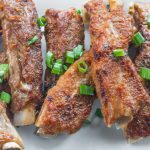 These easy honey garlic ribs (Instant Pot ribs) are sweet and salty and so darn delicious. Perfect as an appetizer on game day, a snack or main dish! Superbowl snacks anyone? 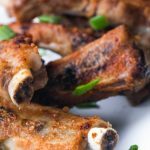 Cut the rib racks into individual ribs and place in the Instant Pot on a trivet. Press the Meat/Stew button and adjust to 40 minutes. Make the Easy Honey Garlic Sauce. Quick pressure release ribs when they are done and lay them out on a rack or broiling pan. Brush on liberal amounts of easy honey garlic sauce and put under the broiler on high for 4 minutes. You can also use the amazing Fermented Honey Garlic, though you'd need to make that in advance. Wait, you and your husband live on opposite coasts? I am on board with you with the whole new year starts in Feb deal! Hope the cough is better now. Wish had an instant pot! That honey garlic sauce sounds lovely! The cough… it is getting better but I think I have a rib out of place, the result of which is pure agony with every cough. But other than that things are looking up! Do you think you could do this with beef ribs too? Did you finally get an Instant Pot Salma? Absolutely! We tried them on beef ribs last night and they were good, it isn’t as strong a flavor on the beef, but still good! Wow, never thought I’d see the words “instant” and “ribs” in the same sentence! Looks amazing. Do you think this would work if I used onion powder instead of the garlic? So they would be honey onion ribs? I suppose so? I don’t know how much, or how the power might change the texture of the sauce. It’s worth a shot! Let me know how it goes! I’ll sure let you know! 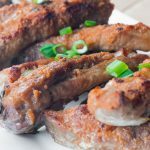 I haven’t tried ribs in the IP yet – it looks like they come out SO good! I can’t wait to try! It’s almost like we don’t need the rest of the kitchen anymore, isn’t it? I love making ribs in the IP. So easy! And that sauce sounds SO good. These ribs look and sound SO good!! I have loved using my IP…they turn out SO tender that way!! So easy. So good. What would the world look like if the Instant Pot had been invented sooner? Cannot wait for grilling season. These are stunning, and the rub is perfect. Every season is grilling season! This sounds sooooo scrumptious – can’t wait to try! Let us know when you do Tina! I’m obsessed with ribs! thank you for the fun variation! What a great obsession lol. I have a cracked one right now. Wow, these look amazing. Love how easy that sauce is too! Ooh! These look awesome. 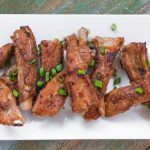 I’ve only done full racks of ribs in the Instant Pot – I’m curious to see how these would turn out in my tiny kitchen! Haven’t done a full rack in there yet. You have the normal 6 quart? I’m so excited to try these. Now that I’m really getting into my Instant Pot I want to try ALL THE THINGS, and keep hearing how great ribs come out. But all the recipes I’ve seen are all sugary, etc. These look right up my alley! Finally! Welcome to the Instant Pot club/cult! 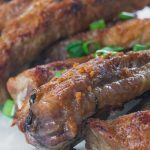 Honey garlic is such an addictive combo, I’ve never tried it on ribs before but that needs to change immediately! These sound amazing! You had me at honey garlic!! Yummm!!! 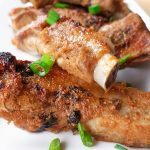 Love ribs and these ribs look so delicious ! Oh, I have some ribs in the freezer right now. This sounds delish! 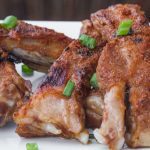 Once I discovered I could make ribs in my Instant Pot, I never went back to boiling or baking. It makes them fall of the bone good! These look delicious. Remember back to the days when we rarely ate processed foods?